Air travel fatalities have been recorded in each of the last 12 years, with a total of 561 deaths in 2018 due to air crashes. However, despite some pronounced year-to-year differences, the overall trend has been for a reduction in the number of fatalities – a trend confirmed when looking at a slightly longer or much longer time frame. According to the Convention on International Civil Aviation, air traffic fatalities refer to an incident where a person is fatally injured due to an occurrence associated with the operation of the aircraft. This definition covers any time from when the first person starts boarding to when the final person disembarks the plane. Corporate jet and military transport accidents are generally excluded. 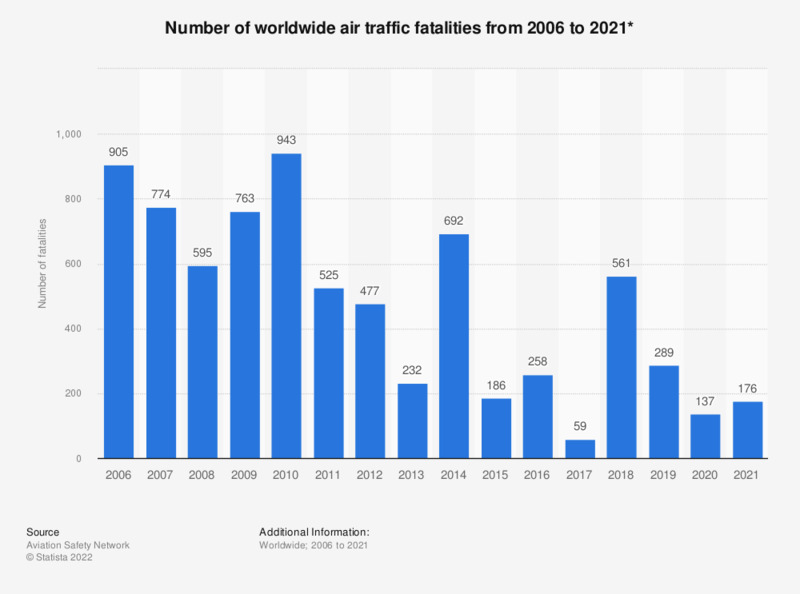 The overall trend downward in air travel fatalities is notable given that the volume of passenger air traffic has increased by more than 66 percent since 2004. Indeed, when considered in terms of the number of accidents per distance travelled, air travel is statistically the safest form of transport. For example, in both the United States and the United Kingdom, air travel is many thousands of times safer than the most dangerous form of travel – motorcycle riding. * These figures include the number of fatal airliner (14+ passengers) hull-loss accidents and fatalities; the figures exclude corporate jet and military transport accidents. The values are as of December 21, 2018.